After the buzz of giving and receiving gifts comes the less thrilling period of broken-down gadgetry, refunds, and returns. If you’re going to get your money back or a working replacement in the quickest time possible, you need to know what options are available to you. Here, we’ll lay out everything you need to be aware of. Of course, these tips can apply at any time of year, no matter what you’re returning, but they’re likely to be most helpful around the holiday season because you’ll typically be opening a stack of new tech that may or may not have been bashed around en route. As with most everything else, your rights when it comes to returns and replacements are governed by both state and federal laws, before you even get to the agreement you’ve got in place with the retailer. In terms of federal law, most major purchases must come with a warranty that’s available for you to read before you part with your cash. If the product fails within the warranty period, it’s up to either the seller or the manufacturer to refund, replace, or repair the item—these are the details that will be in the warranty. Sometimes, as is the case with Apple, the seller and the manufacturer are one and the same. Other times, you’ll need to contact either the retailer or the company that made the product. The details vary from item to item, but it shouldn’t be too hard to find out the logistics if you have physical or digital receipts. If nothing else, try to remember where you bought something from (or ask whoever gave you the gift). At the state law level, you often get implied warranties in lieu of written warranties, but with the vast majority of tech gear—unless you’re buying from someone hawking wares on the street—is going to come with a proper written warranty that guarantees the product should work as advertised. In other words, the law has your back if you’ve unwrapped a dud on Christmas morning. It just might take you a while to work out the exact course of action you need to take. State law can vary considerably, so we won’t cover all 50 states here, but it’s worth looking up the details for yourself. In New York State, for example, retailers are obliged to state their refund and exchange policies, even if it’s “no refunds or exchanges whatsoever”—you should really be wary of buying any Christmas gifts from a retailer with that kind of returns policy. As long as your gear comes from a reputable source, you’ll be okay. If you did your Christmas shopping from eBay and Craigslist, then sellers don’t have to provide a warranty, and you’re not guaranteed a refund—you need to check what the wording was on the original listing. Most private sales are considered “as is,” which means it’s your responsibility to check everything works before you buy. Many professional eBay sellers will offer limited warranties, so again, check the item listing to see the terms of the purchase. If something obviously isn’t working as soon as you’ve pulled it from its packaging, then the place you or your gift-giver bought it from is your first port of call. As with state law, the kind of policies you’re going to come across will vary considerably. Here’s the Walmart policy: You get 90 days to return most items for a refund or a replacement, either by sending it back to Walmart or heading into a store. You only get two weeks for cellphones. You must bring it with the original packaging plus a copy of a receipt—if you can’t prove the item was purchased at Walmart, you can still get a cash refund or an exact replacement. Apple’s policy states you’ve got 14 days to get a refund or a replacement on an item, and it must be returned together with the packaging, the cables, and the documentation—that applies regardless of whether the item is damaged. If you do have a dead iPhone or iMac, the one-year limited warranty comes into play, which guarantees you a repair, a refund, or a replacement at Apple’s cost. The Fitbit policy, meanwhile, gives you a generous 45-day window for returning goods for any reason you like, for a full refund. Like Apple, Fitbit gives you a one-year warranty, too. So if you’ve got a busted fitness tracker, Fitbit will either repair it or replace it for you for free—as long as it was purchased straight from the Fitbit online store. The devices Amazon makes—Fire tablets, Kindles, Echos—come with a one-year warranty that entitles you to a free repair, a replacement, or a refund if you unbox one of these gizmos only to find it’s not working or dies very soon after. Amazon will farm out the repair, if that’s the option you choose, to a third-party company. Look for mentions of broken and damaged goods in these policies and warranties. But remember, retailers aren’t going to give you your money back if you’ve thrown your smartphone against the wall in a fit of Christmas rage, or if your toddler has pulled your wearable to bits. You’re well covered if you’ve been sold a defective product, but beyond that, you probably need separate gadget insurance or an extended warranty. In terms of actually claiming a refund, repair, or replacement, it’s usually just as simple as filling in an online form or taking your gadget back to the store it came from (maybe wait a couple of days if you don’t want to spend the whole Christmas vacation stuck in a returns queue). In the case of something bought online from Amazon, for example, you need to start at the Returns Center here. Most returns or refunds at major retailers will go smoothly provided there’s evidence of the transaction—which in this age of online and debit/credit card shopping is very likely. It sounds blindingly obvious, but read through the return instructions carefully and make sure you’ve included everything that comes in the box. If you bought something in a physical store and you don’t have the receipt for it, you can still print out a bank statement showing the transaction, provided it was purchased using a credit or debit card. A lot of the time, returns and refunds will be at the manager’s discretion, so any kind of corroborating evidence you’ve got is going to help your cause. As mentioned, that means having all the packaging, cables, documentation, and so on—something to bear in mind when unwrapping gifts and setting up your new gadgets. Try and keep everything in one place and well cared for at least until you’ve verified that the devices actually work. We’ve already mentioned the returns queues that you might have to cope with in the days immediately following Christmas, but if you can make it to the local shopping mall, it might be worth choosing this option rather than returning items by mail. 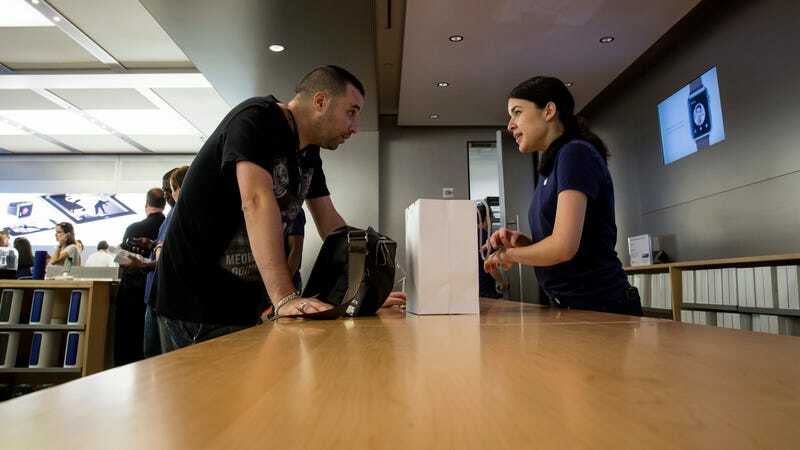 If the store has the right gadget in stock (call ahead to check), many retailers, including Apple and Target, will let you organize a repair, replacement, or refund in a local store even if the item was purchased online. Save yourself a wasted trip buy making sure it really is broken before you take it back. Before you head to the store, make a note of what you tried to do with your busted piece of tech and what happened as a result. Is your phone, tablet, or laptop charged or plugged in? Have you tried turning it off and on again? If you’re dealing with a specific problem, like a strange clicking from the fans on your laptop as soon as it switches on, make sure you can easily reproduce the problem when you get to the store, or make sure to fully explain the issue in writing if you’re mailing it in. This will save time on the other end and ensure you get your replacement as quickly as possible. It’s probably also worth a quick web search to see if anyone else is having the same problem as you are: It could be a manufacturing issue that’s already been identified, and you might find there’s a fix you can apply (maybe a firmware update) without returning your gadget at all. Obviously, this won’t help with a gadget that’s dead-on-arrival, but you might be able to troubleshoot some other problems. If you’ve bought your gear from a reputable retailer, and you really do have a busted gadget, the return process should be reasonably smooth, even though it’s a chore. Don’t put it off, though—the sooner you deal with it, the sooner you’ll get a repair or a replacement so you can start enjoying your tech.